This type of show turns your child into the star of the show. The format of this comedy show allows the child to do the magic with the help of Magic Mike. Live animals are used throughout the show, but sure to keep this a secret from the birthday child. Pick one of our party packages below or customize your own by mixing and matching the best features to suit your child and your party needs. The Birthday Shows are best when done indoors and a minimal performance space is required. If an outdoor show is desired please let us know when booking your party and we will try to meet your needs. Pricing is based on date and time of the event, location and size of the audience will influence the final cost. Birthday Party Packages are based on 12 children. Extra children may be added at a nominal fee. Magic With A Twist�s magic classes are professionally tailored for children 5 years old and up. Each trick taught has been hand selected by Magic Mike. This hands on magical birthday class is sure to be a hit at your next party. The children will learn how to make a magic wand appear along with many other cool tricks. Magic Mike will start off the class by performing each trick, as it should be presented to an audience. Then each child will be given the necessary props and guidance to perform each trick themselves. At the end of the class each child will have all the props including their very own magic wand, to perform magic for family and friends. For completing the class each student will also receive an official Magic With A Twist�s diploma. The birthday party magic class is based on 12 children. Pricing is based on date and time of the event, location and size of the class will influence the final cost. Extra children may be added at a nominal fee. 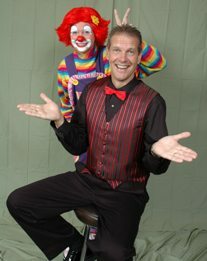 Comedy magic shows will amaze, delight, and bring a smile to everyone's face. It provides fantastic entertainment for all age groups. Ideal for: Social events, Parties, Adult Birthday Parties, Churches, Weddings, Civic Groups and Fundraisers. This show requires a reasonable performance space. Pricing is based on date, time, and location of the event and the size of the audience. Regular magic show is serious and intense magic that will have your audience afraid to blink. The fast-paced high-energy performance will have your audience on the edge of their seats as animals appear and disappear. It is perfect for: social events, parties, churches, weddings, civic groups and fundraisers. This show requires a reasonable performance space. Adult shows provide more in-depth magic for the sophisticated audience. The show is packed with mind-boggling stunts that will keep the audience amazed. This show requires a reasonable performance space. A very exciting form of magic because it is done up close and right before your eyes! This type of magic is perfectly designed for cocktail parties, dinner events, tradeshows, grand openings and receptions. Walk-Around Magic captivates small groups of people on a one-on-one basis. Magician Michael Gilliland entertains with magic that happens right in the guest's hands! You can even combine strolling magic with any other show. Pricing is based on date, time, location and the size of the event. The trades show format is an excellent way to promote your company and its products. This format is the ideal way to give your company an edge that your competitors lack. Michael will tailor his show to your company needs with an extraordinary presentation that will have customers flocking to your booth. His trade shows are packed with enthusiasm and comedy. 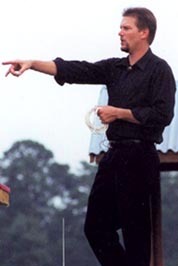 Magician Michael Gilliland is a well-trained and experienced motivational speaker. This is the perfect way to reach out and communicate to your potential customers.